A hydrogen bond is the chemical bond in which a hydrogen atom is attracted to an electromagnetic atom. It is responsible for many of the properties of water. 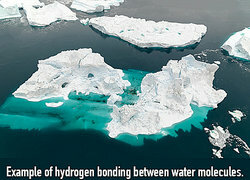 Hydrogen bonding occurs most famously between water molecules. When one molecule of water attracts another the two can bond together; adding more molecules results in more and more water sticking together. This bond is responsible for the crystal structure of ice, which allows it to float. Human DNA is an interesting example of a hydrogen bond. In fact, the hydrogen bonding that occurs between base pairs in a strand of DNA results in DNA's familiar double helix shape. This hydrogen bond actually enables the replication of DNA strands. Hydroflouric and formic acids have a special type of hydrogen bond called a symmetric hydrogen bond. This bond is much stronger than a regular hydrogen bond, and can be seen in these acids when they are kept at a high pressure. Hydrogen bonds between proteins result in a phenomenon known as "protein folding." In order to make a functional shape, a protein has to fold over itself. The intra-molecular hydrogen bond is necessary for these proteins to hold their shape and remain stable once they have folded. Sorbitol dehydrogenase is an example of a protein that is dependent on hydrogen bonding. It works to convert the sugar alcohol version of glucose into fructose, the same sugar found in many fruits (and in high fructose corn syrup). Hydrogen bonding stabilizes the entire structure, which keeps the protein from falling apart. Nylon, a synthetic polymer famous for its stretchy qualities, is another hydrogen bond example. The hydrogen bonds in the molecules of this man-made material are responsible for the crystallization of the material in the amide repeat unit. Cellulose is an organic compound found in trees, cotton, and dried hemp, and can be used to make paper, textiles, rayon, and cellophane. Hydrogen bonds are important to maintaining the shape and form of the cellulose compound. Any polymer that has amide or carbonyl groups within can form hydrogen bonds. As a result, these polymers often have relatively high melting points as well as high tensile strength. Polyurethane and urea are among examples polymers that contain hydrogen bonding between molecules. Hydrogen bonds happen in alcohols. As a matter of fact, any molecule that contains a hydrogen atom attached to an atom of nitrogen or oxygen is capable of such a bond. Ethanol is one such alcohol that features hydrogen bonds. Ammonia is an example of hydrogen bonding. In the case of ammonia, however, the hydrogen bond happens to be relatively weak. This is simply because each nitrogen has one lone pair, which is not enough for all of the hydrogen atoms present. Molecules containing N- or H-groups allow hydrogen bonding. Examples of these include methylamine, as well as some of the larger proteins and double helix DNA strands discussed above. As you can see from these hydrogen bond examples, many of the substances that you encounter in your every day life are formed from hydrogen bonds. Now you can recognize these hydrogen bond examples when you see them. "Hydrogen Bond Examples." YourDictionary, n.d. Web. 18 April 2019. <https://examples.yourdictionary.com/hydrogen-bond-examples.html>. What Kind of Drugs Did Jimi Hendrix Take?